"Amy is one of the most knowledgeable and skilled therapists i've seen. She's helped me resolve several issues for which I'm very grateful"
"I went to Amy for treatment following back surgery. Within four sessions I was feeling much better and was experiencing a significant decrease in muscle tension"
"Being disciplined in different therapies is such a bonus as she can use different techniques in the same session"
"Amy has been amazing! She has really listened and researched how my life affects my body and catered the treatment to suit me as an individual"
"I have had various massages over the years but never felt as welcomed, put at ease and treated with patience and understanding"
"She always manages to sort out my sacro-iliac back problems when they arise, combining intensive and effective muscular treatment with a soothing, holistic approach"
Amy spent a long time listening to my issue, then formed a comprehensive plan for the hour and following week, which has led to complete resolution of my problem. She polite, professional and very friendly. I plan on going back again if I ever have any new problems. 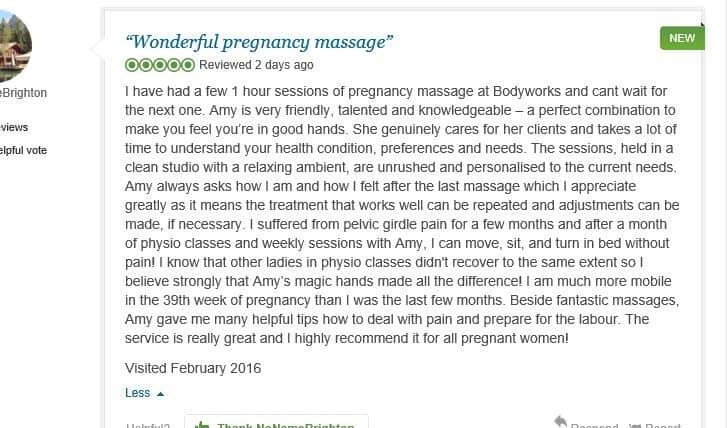 "The techniques that Amy applies allow for a much less painful experience during the massage and the muscle pain is most negligible in the subsequent days"
"Other ladies in physio classes didn't recover to the same extent so I believe Amy's magic hands made all the difference!" "I have tried quite a few different bodyworkers but Amy is my favourite. She is extremely knowledgeable, and sensitive- I always leave feeling great"
After my first session with Amy I booked a block of 6 with her as I was so impressed with her practice - and which makes the cost really reasonable. I have tried quite a few different bodyworkers in Brighton, but Amy is my favourite. She is extremely knowledgeable, and also extremely sensitive--able to really tune in to the exact spots that need work. I really like how she incorporates a range of different approaches, using Muscle Energy Techniques alongside soft tissue work to try and get at the cause of the problem (misalignments) rather than just the symptom (the pain in the muscles). I have various issues with my shoulder and low back, as well as going through some very busy and stressful times. I always leave feeling great, physically and mentally. The clinic in her home is a nice calm and comfortable space, and Amy is a wonderful person to work with. Highly recommended. "I was completely satisfied with Amy's professional approach and her warmth.. A remarkable combination"